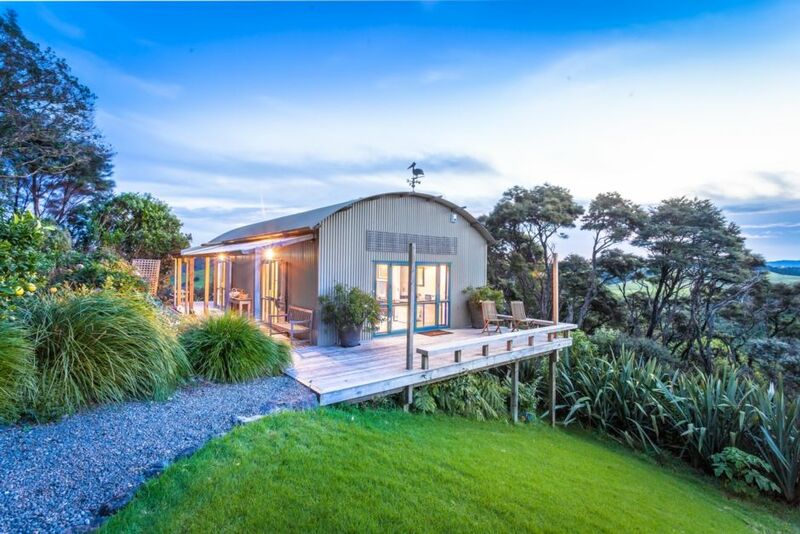 Situated on a coastal ridge with sweeping views, Kākā Ridge Retreat is a two-room, 60 square metre, cottage offering you privacy and tranquility. Boasting a bedroom, a living room, two bathrooms, decks on three sides, an outdoor bath and a pretty cottage garden, it is designed to provide you with the ultimate getaway. The luxurious bedroom is French country chic with a super comfortable king bed to ensure you’re well rested. From your bedroom you have a stunning view of the sea – a 180 degree vista including near and far islands of the Hauraki Gulf. Your living room looks across a gently sloping lawn directly at a huge stand of covenanted native bush. This is a bird lover’s paradise: tūī, kererū, kākā, ruru, pīwakawaka, kōtare, kākāriki and korimako visit our gardens. If you’re lucky at dusk you will see a flock of kākā flying overhead or ruru in the trees catching their puriri moth dinner. You will even have the best “loo with a view” in New Zealand. The second bathroom feels as though it’s totally immersed in the bush canopy. This retro styled room is relaxingly comfortable and includes a small dining area plus fridge, kettle, toaster, microwave, and a disposable BBQ; everything you need for the delicious continental breakfast we provide, or to put together a simple meal. For dinner, we highly recommend you try one of the many wonderful local restaurants. You can even order in as there's a food delivery service that will deliver to the cottage door. Access to Kākā Ridge Retreat is via our driveway and shared parking area with a short walk past the house. The cottage is separate from the house and once there you can enjoy your peaceful seclusion with only birdsong to interrupt your thoughts. The cottage garden and a large native tree area create space and visual privacy from the main house. Property is non-smoking inside and outside. My husband John and I moved from Auckland city to the Tāwharanui Peninsula in 2015. We love it here and have never missed city living once! Prior to living in Tāwharanui John and I had corporate careers in telecommunications and project management. We still do consulting work from home and travel to Auckland for work from time to time. We love the peace and quiet and the abundance of bush, birds and sea. We are lucky enough to have a completely separate cottage on our property that we renovated for short term rental during 2016. Beautiful bush and sea views, wonderful bird life, privacy and a 15 minute drive to Matakana Village or five minutes the other way to Tāwharanui Regional Park. The cottage is fully equipped for travellers looking for privacy, seclusion, the beauty of nature and some luxury. There is so much to do here and it's classic New Zealand. We provide all bed linen. There is a dedicated parking space near the front door of our house. We provide towels, beach towels and tea towels. The cottage has a bedroom and a separate living room containing a TV, chairs and small table. A plunger and ground coffee (including decaf) provided. The living room includes a small dining table. Freeview only and reception is not 100% reliable. Fantastic cottage, the view is amazing. Well appointed. Katherine and John are there if you need them but respect your privacy. Fabulous continental breakfast and not having to wash up is a luxury. A very relaxed and romantic cottage. Fantastic accomodation, beautiful setting and great service. Fantastic accomodation, beautiful setting and great service. We wanted to escape for a night and and the cottage had everything we needed, great views, peaceful and excellent breakfast. We hope to visit again! Beautiful location and loved the two bathrooms - very cool! Beautiful location and loved the two bathrooms - very cool!! Wow... The location of this private cottage is magnificent. Overlooking the ocean and separated from the main house, it was a wonderful place for my wife and I to stay during our honeymoon. It has everything we could’ve possibly needed. Highly recommended! The perfect location to rest and relax. The perfect location to rest and relax. I loved watching the changing colours as the sun set (almost rivalled a Broome sunset! ).